You may have heard of Wealthfront (formerly kaChing), a startup that has been disrupting the investing and personal finance space. As we’ve written in the past, Wealthfront made it possible for average investors to access registered money managers who otherwise might require a minimum investment of $1 million or more. Today, Wealthfront is launching its online financial advisor for the tech community, appealing to professionals from the tech communities who favor doing everything online, and are looking for ways to have their new wealth managed for far lower fees. Finding (and paying for) a high-quality financial advisor can be a challenging task. First, you may not meet the minimum for some private wealth management advisors, which require millions under investment. And if you do qualify, these advisors take 1 percent or more of the returns. What makes Wealthfront’s web service unique is that it brings the quality investment theories of a fund manager online, at a much lower fee, essentially democratizing private wealth management to the masses. The company uses the industry-standard Modern Portfolio Theory, which until now, has been kept out of consumers’ reach, and was only accessible via expensive financial advisors. MPT optimizes your portfolio’s expected returns for your acceptable level of risk. Until now, rigorous MPT-based financial advice has only been available through high-end financial advisors. Wealthfront automates the application of this investment model, which was open sourced by Goldman Sachs. Co-founder Andy Rachleff, who was formerly a founder of Benchmark Capital, explains that the startup is targeting the tech community initially because this community feels comfortable managing money online. And Rachleff adds that many professionals in tech actually started asking Wealthfront for a specialized online platform. When you begin using Wealthfront, the platform will ask you a number of questions to evaluate your risk, in order to create a tailored investment plan. 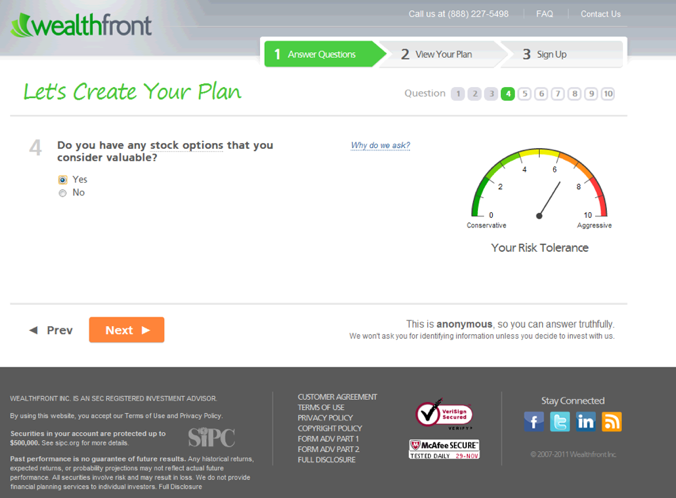 For example, Wealthfront will ask if you own stock options, if you’ve ever made an angel investment, etc. The platform will then recommend an optimized portfolio of carefully selected Exchange Traded Funds (ETFs) spanning six asset classes, and monitors and periodically rebalances the investment mix to maintain a customer’s desired risk tolerance. Rachleff explains that Wealthfront only uses exchange traded index funds because the target audience of tech professionals tend to be fans of ETFs because of low-cost nature. Another element of the platform that Rachleff highlights is transparency. 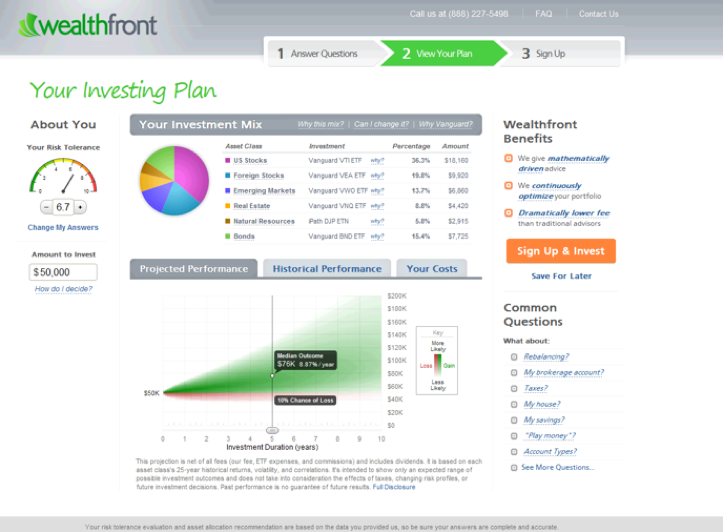 Wealthfront will show precisely what you’ll invest in before you commit. Users have full visibility into how their portfolio is performing at any time. And there are no advisory fees on a customer’s first $25,000 under management, and only a fee of 0.25% on assets exceeding $25,000. And the timing is right for a focused platform focused on money management for tech professionals. With the current liquidity taking place in the tech world with both acquisitions and the IPOs of LinkedIn, Pandora, and many more to come, Wealthfront is an appealing alternative to putting your money with a Goldman Sachs, UBS or other private wealth manager. Already, Rachleff says the number of early employees of Facebook, Skype, LinkedIn, and Zynga have signed up to use the platform. The startup has raised over $10 million from DAG Ventures and individual investors including Marc Andreessen, Jeff Jordan and partners from Benchmark Capital, Index Ventures and Kleiner Perkins Caufield & Byers. Wealthfront faces competition from Betterment.